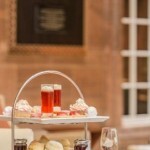 Enjoy one of the best afternoon teas in Edinburgh in the gorgeous surrounds of the Waldorf Astoria – or Caley Hotel as known affectionately by locals. 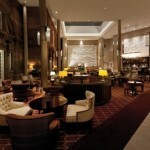 Located in the heart of the hotel, in what was once the former station concourse and ticket office, Peacock Alley offers the style and glamour of a bygone era. Undoubtedly a superb venue for people watching in gorgeous surrounds, the afternoon tea menu offers a decadent selection of finger sandwiches, pastries, scones and cakes. Afternoon tea is served with a selection of loose leaf tea or coffee. For a special treat why not splash out with a sparkling glass of fizz. Children are also welcome and catered for with treats such as jam, peanut butter or ham and cheese sandwiches along with carrot cakes, macaroons and chocolate, nut brownies. Situated within a few minutes walk of Edinburgh’s Haymarket Station, the Caley Hotel is the perfect venue for not only afternoon tea but also a great day out in the capital. A popular venue, be sure to book in advance. To reserve your table, simply click on the Book Now button and book direct. 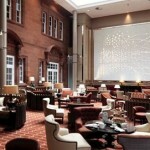 Afternoon Tea in Edinburgh: The Waldorf Astoria, is the perfect venue for the ultimate girls afternoon tea.